From beginner to elite, there are a variety of local summer sports camps to help your child learn new skills, make lifelong friendships and participate in lots of hands-on fun. Many sports camps welcome children of all skill levels and have special techniques to help your beginner learn the fundamentals of the game and set the foundation for a lifelong passion of playing sports. Pam Frasco, of Avon Lake, has signed up her son Sonny for some small camps with Preschool Sports/LCSC Youth Sports since he was 3 years old. Game On! Sports 4 Girls camp owner Barb Lazarus adds that it’s very important that beginner athletes are exposed to sports in a supportive environment with encouraging coaches and mentors. Sports camp isn’t just about learning the game; it also teaches sportsmanship and being part of a team. Heights United Soccer Academy Director Sean Sullivan says intermixing skilled players with the newbies provides an opportunity for the older children to serve as mentors, while the inexperienced children have an opportunity to build confidence while learning to play the game. 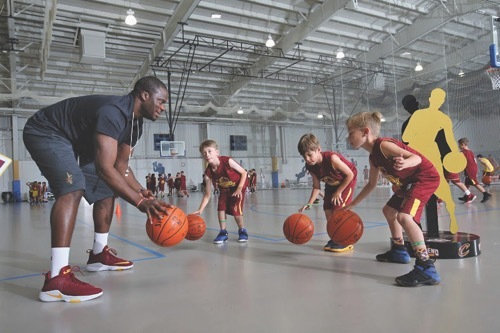 While your child will likely get to participate in some sporting activities at a regular day camp, a sports camp can provide more targeted lessons to help your child achieve their athletic goals. At sports camps, highly trained coaches and counselors are on hand to help athletes build upon their skills and learn new techniques. Sports camps promote physical activity, social skills and a healthy lifestyle. “We teach life lessons through sports, which are very vital to the next stages of life,” says Ptacek. Camp organizers add that they can see children become more confident as they progress through camp, which translates into success in the school year. Kids also make friends and learn to play on a team. Wondering if Your Child can Physically Handle a Sports Camp this Summer? Dr. Sean Cupp, co-director of Sports Medicine at University Hospitals Cleveland Medical Center and lead medical team physician for the Cleveland Browns, says most kids should be able to endure a few active hours at camp with no issues. “Unless they have a baseline orthopedic problem or baseline medical problem, then most kids are healthy and should be able to handle any physical activity, even 6-8 hours at a sports camp,” he says. Before you send your child off to camp, Cupp recommends packing a refillable water bottle and a healthy snack. He says you also can pack a protein bar for teens participating in more intense camps. Lastly, make sure the camp is aware of any medical conditions your child may have and pack proper allergy and emergency medications. He says healthy children should participate in at least 60 minutes of active play a day.